The “Lotto Gotico” is a type of medieval buildig which is squezed between two other units. This means that there is a short side that is strongly inferior at the expense of the long side ( where we can find shared walls of the other houses). The light can shine trough only from the free sides; the solution to be able to have more light is to create a courtyard. Solution adopeted even for this project. The buiding is therefor divided in three vertical stripes, putting at the center the vertical connection, bringing the light from above. The entrance and the living room are to be found on the right strip, proceding we can find the stairs that dived us from the kitchen and dining room in the courtyard. 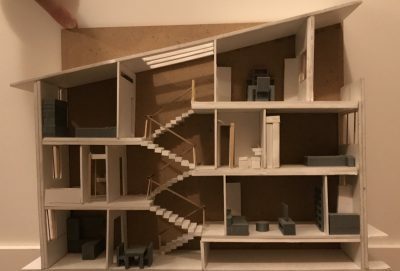 The stair is composed by a series of ramps and connects the lateral floors ( where we can find the two bedrooms and two bathrooms), up to the study room located at the top of the house, with a terrace and panoramic view. All the house enveroinments are organised by a study of the fluxes in the insede of the building. At first sight, entering the building, we can find the shared spaces (living room, dining room and kitchen) iluminated by the light that shines from the opposites end sides of the house. The bathroom is based ubove the kitchen so that it can be easly accesed from the living room and sleeping room. Meanwhile the bedrooms are situated up stairs, just like in ancient houses ( main floor and obove). The study room is located on the top floor, to be far away from others so tha we are able to think hard and freely while admiring the view from the balcony. This project was made to fix the problems of the “Lotto Gotico” (poor light, tight spaces) creating a peaceful enveroiment whilst remaning “in between” buildings and streets. This entry was posted on Friday, July 6th, 2018 at 12:17 am	and is filed under Biennale of Venice, students' work.